Frank W - 4/4 - The personal blog of Frank Whitestone - tall, dark, and handsome Toronto-based digital product builder, startup enthusiast, entrepreneurial thinker, social justice advocate, NLP practitioner & personal development fan, snowboarder, technology aficionado, clean eater. I checked my mail this morning, and amongst a collection of bills and a nice letter from the Canada Revenue Agency telling me I have a credit against my corporate payroll account (I.E. 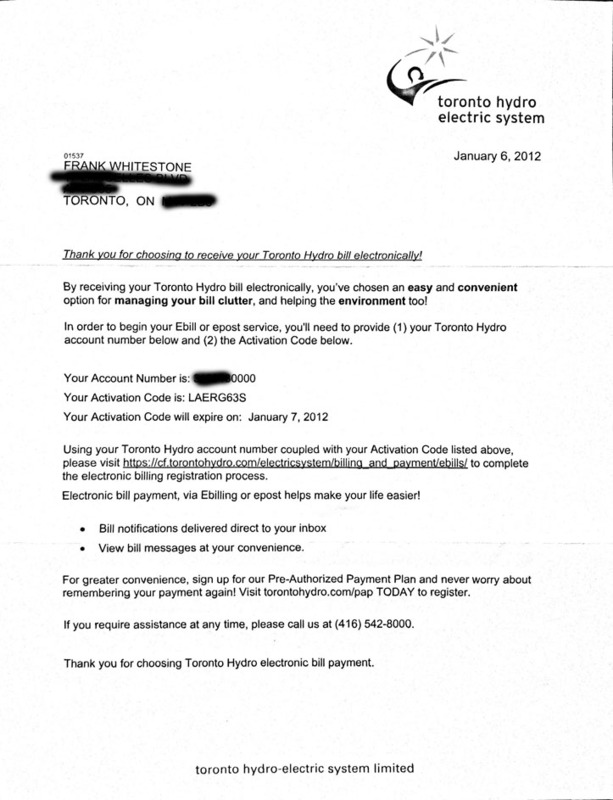 they have not applied my cheque properly yet), I received a letter from Toronto Hydro informing of my access details for online billing. Now I followed their process to request an “activation code” on November 26 (according to agent I spoke to this morning). As you can see, the letter is dated, January 6, 2012 and I received it today – January 18. There is a 5 week delay why exactly? Now take a look at the Activation Code expiry date. The customer service agent I spoke to this morning could not explain this to me. Having informed her the date was not a typo and the code actually did not work, her suggestion was to request another code online, and to “call a few days after to get the code”. What is the point of this? If the letter is anything to go by, the code will have expired the next day. Nor I should not have to call to get a code that may or may not have expired the next day. Why do I even need a code anyway? The whole point of this is to use less paper – why are you mailing me a code? I am able to verify my identity with your contact centre using my account number, name and address. Why can I not do the same on your website? If you insist on making customers enter an activation code online, then send it out within a few days of it being requested. If you are going to send a code, make sure it works. A 1 day expiry is quite frankly ridiculous. How about a customer friendly URL to enter the activation code. Why not redirect, say, http://www.torontohydro.com/activation/ to that stupid long URL. Do you really expect me to type that in from the letter? If the process is broken, as it clearly is here, make sure that your contact centre can actually help customers who call in with problems. Why can the lady I spoke to not sign me up for ebilling on the spot? Or request another code for me? Come on Toronto Hydro, I expect more from the electricity company of Canada’s largest city. What a stupid process. It’s been a while since I have blogged – probably back before 2003 if I recall correctly. Since then, I have been using Twitter a fair bit when I get the urge. I feel there’s a lower barrier to Twitter and it’s a lot easier to write a 140 character tweet than it is to write a blog post. Anyway, I’ve decided to try my hand at blogging again. So here it is people – lean and mean. Until I add more posts and fix up the template to make it aesthetically pleasing.